english name "de Loose's Slender(?) Caesar"
intro The following description is based on the original description by Beeli (1936). cap The cap of A. loosii is 130 - 160 mm wide, globose then plano-convex, smooth, brilliant white becoming cream with a tan (chamois) center, with a striate margin. Volval remnants are absent. The flesh is white. gills The gills are free, crowded, narrowed to a point at the stem, up to 10 mm broad, white, with minutely irregular edge. stem The stem is 100 - 120 × 18 - 25 mm, cylindric or narrowing upward slightly, smooth, becoming hollow, pure white, smooth. 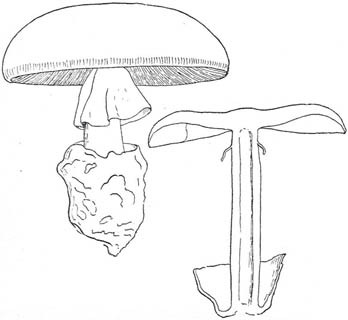 The ring membranous, skirt-like, pure white, and attached near the top of the stem. The volva is ample, membranous, and brown on the exterior. The flesh is white. odor/taste The mushroom is edible and very much appreciated by the local population. The flesh has an odor of citron. The taste is agreeable but not very pronounced. spores The spores measure 14 - 15 × 10 - 11 µm and are probably broadly ellipsoid to ellipsoid and inamyloid. Clamps are probably present at bases of basidia. Walleyn and Verbeken (pers. corresp.) selected a lectotype for A. loosi and measured spores from the lectotype with the following results: 10.1 - 12.5 × 7.4 - 10.7 µm; however, they noted that the basidiomes had become quite moldy. RET's experience indicates that moldy specimens tend to have smaller spores than those in good condition and that spores and the apices of basidia are often destroyed by invasive molds. discussion This species was originally described from the then Belgian Congo. author Beeli. 1936. Bull. Jard. Bot. État 14: 90, pl. 3 (fig. 1). revisions Walleyn and Verbeken. 1998. Belgian J. Bot 131(2): 157. The following material is derived from the protolog of the present taxon and the work of other cited researchers. pileus from protolog: 130 - 160 mm wide, brilliant white at first, becoming cream with chamois disc, globose at first, then plano-convex, bare; context white, unchanging; margin striate (short-striate per figure). lamellae from protolog: free, crowded, white, 10 mm broad, pointed toward stipe, broadened toward pileus margin, broadest ca. two-thirds to three-quarters of length (per figure); lamellulae rounded truncate (per figure). stipe from protolog: 100 - 120 × 18 - 25 mm, pure white, cylindric broadening slightly near base; context becoming hollow, white, glabrous, smooth; partial veil apical, membranous, pure white, ample and skirt-like (per figure); universal veil membranous, ample, saccate (per figure), with brownish exterior, enclosing bottom third or more of stipe (per figure). odor/taste from protolog: Odor like that of citron. Taste not very distinct. material examined from protolog: CONGO, DEMOCRATIC REPUBLIC OF: KATANGA PROV.—Lubumbashi (formerly Elisabethville) [ca. 1,000 m], 25.xii.1931 F. De Loose 7 (paratype, BR, formerly including material preserved in formol and now comprising only drawing and notes per Walleyn and Verbeken (1998)), 27.xii.1932 F. De Loose 2 ["B2" per Walleyn and Verbeken (1998)] (lectotype, BR). Gilbert (1940): CONGO, DEMOCRATIC REPUBLIC OF: KATANGA PROV.—Lubumbashi (formerly Elisabethville) [ca. 1,000 m], 27.xii.1932 F. De Loose 2 ["B2" per Walleyn and Verbeken (1998)] (lectotype, BR). discussion On the basis macroscopic characters and spore size and shape, Walleyn and Verbeken synonymize A. zambiana with the present species. We are somewhat tentative about this because the original description of the present species could be read to say that the pileus is entirely brilliant white at first; the odor is described as like that of citron; and the taste, as not distinctive. On the other hand A. zambiana has a pileus that is almost entirely brown at first and is said to be unpleasant to the European palate and an acquired taste. 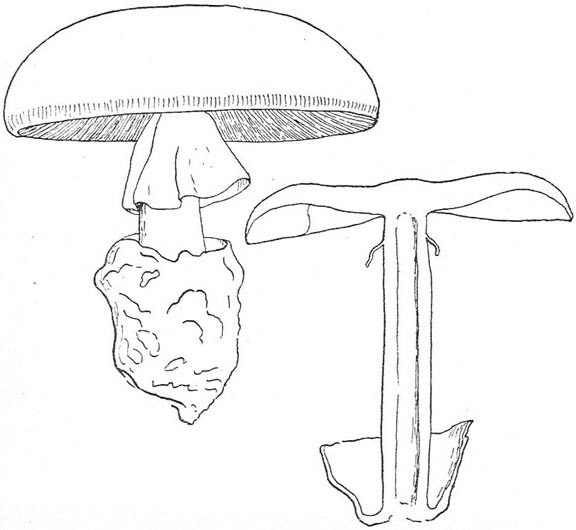 A comparison of the sporographs of the present species and A. zambiana are presented below. It should be noted that the data for A. zambiana is based on 140 spores measured by the methodology that is standard to this site, while the data for A. loosii is based on Q calculations for two spores and the size data was derived from measurements of a total of 12 spores. Even though the match between the sporographs seems good, under the circumstances, the apparent similarity could be accidental. The conservative position would be to withhold judgment on synonymy of the two names discussed above. 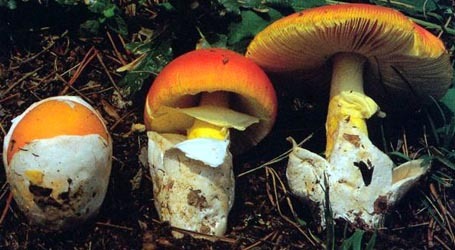 According to the protolog this species is a widely appreciated comestible that was common in the Elisabethville region. Beeli reported the following indigenous names recorded by de Loose for this species: Tente (Kiswuili), Kilva (Kasengo), and Tedia (Elisabethville). drawing M. Beeli based on colored pencil drawing(s) of F. De Loose - (1) Lubumbashi (formerly Elisabethville), Democratic Republic of Congo.